Look at the Earth—isn't it beautiful? Blue oceans, white polar ice-caps, and verdant green land. Some brown as well, where there aren't as many plants. But why are those parts of our Earth barren, and others green? I mean, deserts cover much of Africa and Australia, but not Europe?! Europeans, it turns out, discovered the answer, but in the most unlikely of places—the oceans! When sailing from Europe, trade winds pushed ships enthusiastically southwest to the equator, where suddenly, the winds would die. These were the doldrums—and for sailors, they were a pain. They were also annoying to scientists like Galileo, Kepler, and Halley, who all had theories about why the wind blew to the southwest. Did the wind somehow follow the sun from morning til night? Or maybe it had trouble keeping up with the ground spinning beneath it? Who Answered Such Complex Question? In 1735, a London lawyer and amateur meteorologist named George Hadley came up with an even brighter idea that ultimately helped explain not just ocean winds, but also why our planet has rainforests in a belt near the equator and deserts just north and south of that. Hadley figured that, since the sun warms the Earth most at the equator, air to the north and south must be cooler—and therefore more dense. 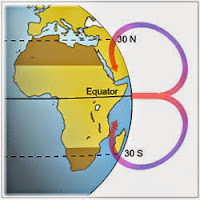 Just as cold air rushes in through an open door in winter, cool air north and south of the equator must flow toward the warm air in the middle, bringing sailors with it. There, in the doldrums, the air didn't actually stop moving, it just headed upwards, heat rising to make way for the denser air flowing in from both sides. As warm, humid air at the equator rises, it cools, and--since cool air can't hold as much moisture as warm air--it rains. A lot! Enough to make rain-forests. After reaching an altitude of about 17 kilometers, the rising (and drying) air hits the stratosphere, which acts kind of like a ceiling, causing the warm air to spread out and separate—some goes north, some south. As the air leaves the equator, it rains away more moisture, becoming denser and slightly cooler, until finally dry, it sinks, creating the arid bands where many of the world's famous deserts lie. This giant atmospheric conveyor belt, officially called a Hadley cell, brings us both tropical rainforests and deserts. So, the locations of the greens and browns of the Earth come courtesy of a lot of hot air. Thank you for reading The Real Fact Why Our Earth Has Both Desert and Green Rainforest posted on the website Kwentology if you want to redistribute this article please include the link as the source. Have some kuwento to share? Contact us!